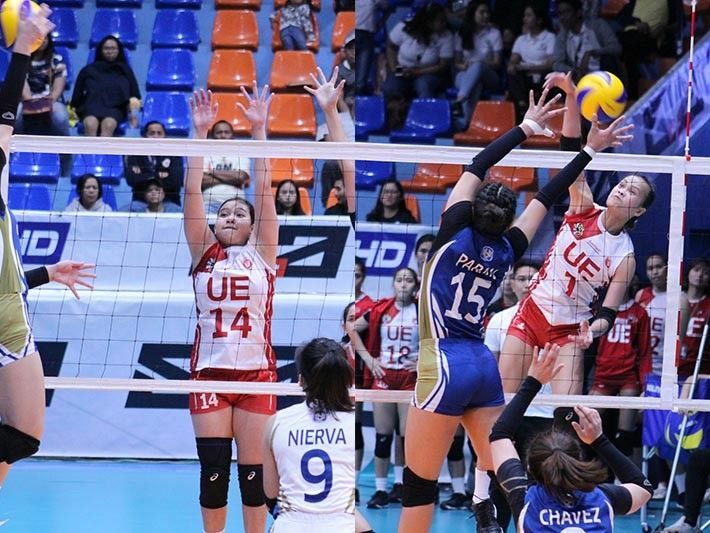 UE seniors Lai Bendong (14) and Judith Abil (1) contributed significantly in their victory against the NU Lady Bulldogs in their second round meeting at the FilOil Flying V Centre on Wednesday, March 20, 2019. Bendong finished with 39 excellent sets while Abil had a triple-double (13 points, 29 excellent digs and 21 excellent receives). MANILA, Philippines — The UE Lady Warriors have been underdogs in UAAP volleyball's recent history. More often than not, the Recto-based volleybelles find themselves at the bottom of the standings season after season. It's been a while since the Lady Warriors were considered contenders for the championship — despite salvaging a couple of wins here and there. But for graduating players Judith Abil and Lai Bendong, the team's past dismal records don't matter. Instead, Abil and Bendong focus on the present and what they can leave behind to push the Lady Warriors towards a winning tradition. "Binuhos na namin lahat lahat... kasi last year ko na po, last year na rin ni Lai. As seniors, gusto namin may maiwan kami sa UE na maganda," Abil said. "Lagi nireremind samin ni Coach Karl (Dimaculangan) na 'pagkaalis niyo, ano ba yung maiiwan niyo sa mga bata? '," Bendong said. "Iniisip namin na oo nga, ang pangit kung aalis kami nang ganon lang... Dun kami humuhugot na 'hindi, kaya naman talaga natin,'" she added. Giving their all was well rewarded for the Lady Warriors, as they got their second win of the season during their first game of the second round against a young NU Lady Bulldogs squad. Abil finished the match with a triple-double, registering an all-around game with 13 points, 29 excellent digs and 21 excellent receives. For her part, Bendong was a magician in playmaking, finishing their four-set victory with 38 excellent sets for the Lady Warriors. After matching the number of UE's victories last year, where they finished the season 2-12, head coach Karl Dimaculangan wants more from the Lady Warriors. "Kailangan pa nila madevelop na... pag andiyan ka na sa mga crucial points, dapat mature sila para tatapusin talaga nila yung game," Dimaculangan said. "Yung point kailangan talaga nila madeliver," The tactician said. Regardless, Dimaculangan keeps his goals humble. "Kung di man kami aabot sa final four, ilalaban lang namin yung rank namin... na hindi naman kami lagi yung number eight," Dimaculangan said.